From the eight-lane Nairobi-Thika highway built by Chinese construction companies to the ubiquitous Chinese restaurants around town, the signs of China’s activity are everywhere in Kenya—right down to the friendly nihao called out by Kenyans as I walk down a Nairobi street. Chinese investment is similarly evident throughout the continent. In 2009, China overtook the United States as Africa’s biggest trading partner. In 2000, the total Sino-African trade volume was approximately US $10 billion; it is now closer to $200 billion per year. China has been making waves in development assistance as well. It pledged $10 billion for infrastructure and other development projects in 2009, and last year that commitment doubled to $20 billion. Indeed, as the United States ” pivots ” toward Asia, China appears to be pivoting toward Africa. China’s relationship with Africa is often criticized by outsiders as neo-colonialist and exploitative. Critics accuse the Chinese of overlooking human rights abuses to preserve their access to resources and markets. But many Africans, it turns out, are happy to be spared the political strings attached to so much Western investment—to say nothing of the lectures. The key to China’s acceptance in Africa has been its strictly businesslike approach: economic investment without political engagement. Yet there is some evidence that Chinese companies are beginning to wear out their welcome on the continent. Politics aside, some Africans are beginning to recoil at Chinese business practices, and in the future China may have to modify its policies if it wishes to preserve its partnerships. Just as China historically has spurned Western pressure and insisted on “non-interference” in its own internal politics, so too it generally refrains from political involvement in Africa. China’s approach to the continent at large was neatly reflected in its response to the recent Kenyan elections. On March 9, Kenyan voters elected Uhuru Kenyatta as president and William Ruto as vice president in a narrowly decided election. Both are facing indictments from the International Criminal Court (ICC) for allegedly orchestrating the violence that followed Kenya’s 2007 presidential elections. While Western governments voiced concern over the election of ICC-indictees, China reaffirmed that it would support the country regardless of the electoral outcome. Kenyans often chafe against Western critiques of their candidates, resenting comments from their former colonial rulers about whether their own leaders are “acceptable.” In Kenyatta’s words, “the people of Kenya – and they alone – have the power and the mandate to determine the leadership of this great country.” The vast majority of Kenyans I have spoken with appreciate China’s deference on the ICC issue and the country’s greater involvement in Kenya’s economic development. In fact, a 2011 Pew Poll showed that 71 percent of Kenyans viewed China “favorably” (down from 86 percent in 2010, when China announced several large infrastructure projects that may have accounted for the bump in ratings). China currently benefits from favoring trade relations over political accountability, but that relationship may sour if Kenyans, and Africans at large, feel exploited by China’s trade and labor practices. Although the Kenyan populace and China appear to be in agreement on the ICC issue for now, in the future China may need to find a way to stem the growing view that Chinese businesses take advantage of African labor and resources. China pairs its sealed lips in Kenya with an extended hand. 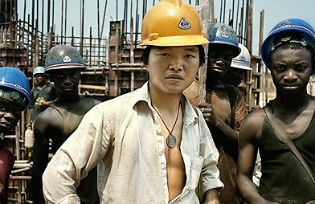 Of the $20 billion China has committed to development assistance in Africa, an estimated $480 million will go to Kenya. To dispense these funds, the Chinese government typically makes loans at below-market or even interest-free rates. Such concessionary loans are often tied to the use of Chinese products and services. Critics complain that this “aid” bypasses the local economies and only benefits Chinese companies, but this is only partly true. It may be the case that local African companies lose out on some competitive contracts. However, the local economy benefits from large-scale development that would not otherwise have occurred, as well as from new training programs and local employment. And complaints that Chinese companies favor Chinese workers over Africans are overblown. Most countries have regulations that encourage the hiring of local staff. For example, 70 percent of labor in companies operating in Angola must be local, and in 2012 Kenya restricted the number of work permits for expatriates. Still, Kenya only enacted the law in response to growing public concern that foreign labor displaces local workers. Whether that fear was founded in reality matters not in the court of public opinion. China has responded proactively to accusations that it is not imparting skills to the local population, setting up local job-training programs in partnership with local authorities. One striking example in Kenya is the partnership between AVIC, the Chinese state-owned aviation company, and Kenya’s Ministry of Education. In an effort to equip Kenya’s workforce with increased engineering and manufacturing capacity, China has provided Kenyan schools with USD $24 million in loans to both acquire manufacturing equipment and train Kenyan instructors in its use. I toured the facilities while Kenyans were being trained and found an engaged partnership between the two parties. The manufacturing equipment and training have been dispersed to 10 different polytechnic institutes around Kenya, and AVIC International plans to add dozens more schools in the coming year. Faced with criticism for ignoring human rights abuses and being narrowly focused on resource extraction, China has tried to improve its image by building schools, providing aid, and training Kenyans in manufacturing. Despite China’s clearly self-interested motives and some public relations fumbles, Kenyans do benefit from the trainings and the development. Elsewhere on the continent, however, the seams of this tight relationship are becoming stretched. Some African countries have been more vocal than Kenya about bad experiences with China. Recently, Zambia took control of a Chinese copper mine after numerous complaints of labor abuses. Botswana’s president called for a reduction in new contracts to Chinese companies, citing poor construction and delays. In January, Nigerian workers protested employment conditions at a Chinese construction site, complaining that “we work for seven days a week and make peanuts.” And in Angola, which exports oil and natural resources to China, China’s resource-driven policies have been roundly criticized. Last year in Beijing, President Jacob Zuma of South Africa cautioned that Africa’s lopsided trade relationship with China is “unsustainable in the long term.” Despite the appeal in Africa of China’s non-interference in political issues, China’s economic policies themselves cannot last. So far in Kenya, China’s burgeoning presence is welcome. Kenyans appreciate the trade that comes absent conditionality and the infrastructure that strengthens their economy. Should China mismanage its relationship or provide poor products, however, it may see a worsening situation in Kenya. Rumblings of discontent about the quality of products have already occurred, and in August concerns about competition resulted in a protest against Chinese vendors in Nairobi. China thrives on trading and providing development assistance in Africa, while also allowing local economies to compete and benefit from the increased economic activity. But China’s continued presence in Africa depends not just on mutual profitability, but also on image. Poor labor practices stoke resentment; haphazard encroachments on local markets kindle protectionism. Any of these could destabilize the relationship in the medium to long term. China’s presence in Kenya is presently beneficial to both countries. Whether that presence will be helpful in the long run depends on the actions China chooses to take, and the expectations Kenyans set for their trading partner. Nan Chen is a lawyer and a contributor to Foreign Policy In Focus. Article courtesy of Foreign Policy In Focus.